Two days ago I filmed a live session at a recording studio with electronic artist Jim Hickey . As there were five of us and we had to work till late, I wanted to prepare something nice for us to eat to feed the energetic mood. I didn’t have much time to prepare, so a box of couscous caught my attention (5 minutes and it’s done!). My mother had just sent it to me a couple days before because, I think, something that has to sit rather than cook for just a few minutes didn’t quite satisfy her idea of cooking. 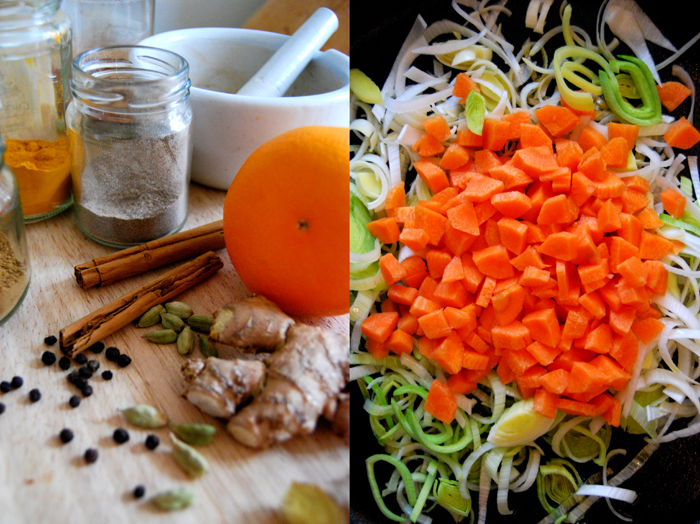 I had half an hour to enhance it a bit so I decided to mix it with slices of leek and carrot and to add some strong exotic flavors – a homemade curry mixture with orange zest, ginger, turmeric, black pepper, cumin, cardamom, cayenne pepper and cinnamon. 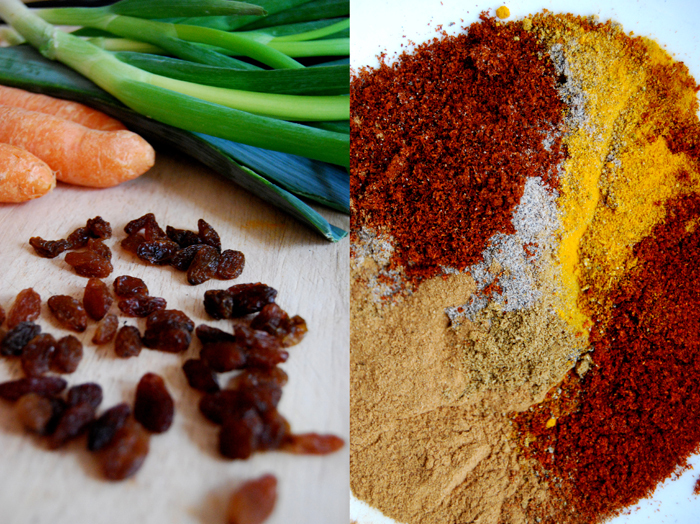 I mixed in some raisins to add some sweetness to the fruity spiciness of the curry mixture. 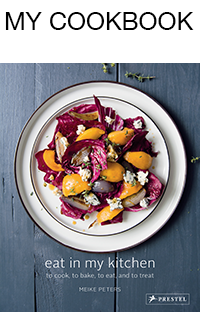 Quick and easy – perfect food to wake you up (exactly what we needed at 11pm)! Let the raisins soak in a cup of hot water. Bring the salty water to the boil. Take the pot off the heat. Add 3 tablespoons of olive oil to the water, add the couscous and mix immediately, close the lid (leave it off the heat). Let it sit for 5 minutes. Add the butter, mix and separate the grains with a fork. Mix all your spices for the curry mixture (including the ginger and orange zest) and grind in a mortar. Warm some olive oil in a large pan and add the leek, spring onions and the carrots. Push the vegetables to the side after a couple minutes, pour some more oil in the middle of the pan and fry 3 teaspoons of your curry mixture for a minute on medium heat. Mix everything together and fry for another 1o minutes (keep in mind that the carrots shouldn’t become too soft). Season with salt. Mix the couscous and the fried vegetables in a big bowl, add the sour cream and more of your curry mixture until you find the right balance of spiciness (I added another 3 teaspoons of the spices at that point, so 6 teaspoons in all). 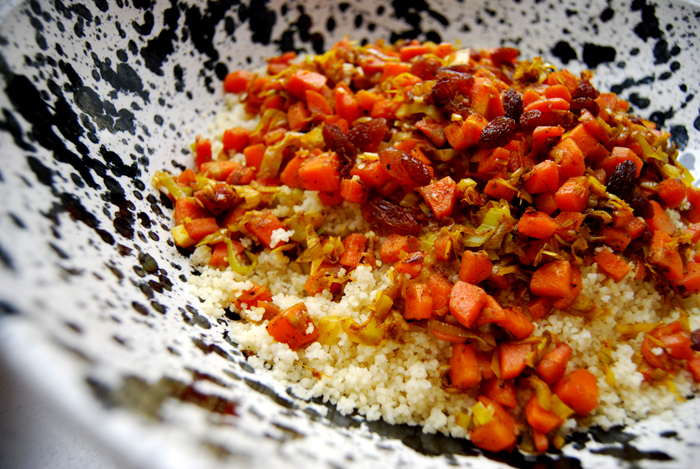 When you are happy with the result, take the raisins out of the water and sprinkle on top of your couscous.